A primary bearer in a falsework application or for supporting formwork. Heavy duty Horizontal or Tilt props can be provided by using standard Super Slim Soldiers with the use of adjustable screw jacks and fixing plates attached to each end of the Soldier. The use of both left and right handed screw jacks turns the Soldier into a large turnbuckle allowing the soldier to be rotated to provide the length adjustment. If rotation of the soldier is not possible we also have an Adjustable Base Jack that can be adjusted by the use of a nut and collar. The Left and Right Screws are colour coded for ease of identification. The allowable load on a Heavy Duty Tilt Prop is dictated by the angle of the prop to the horizontal load and by the method of end connections. The connection of the Tilt Plates to the foundations or wall fixing should be checked to ensure that the SWL load capacity of the fixing used matches the required Tilt Prop load. Other sizes may be available, please enquire at your local branch. Values falling in the shaded area exceed the limiting value of 80 kN, for props up to 5.215m long. 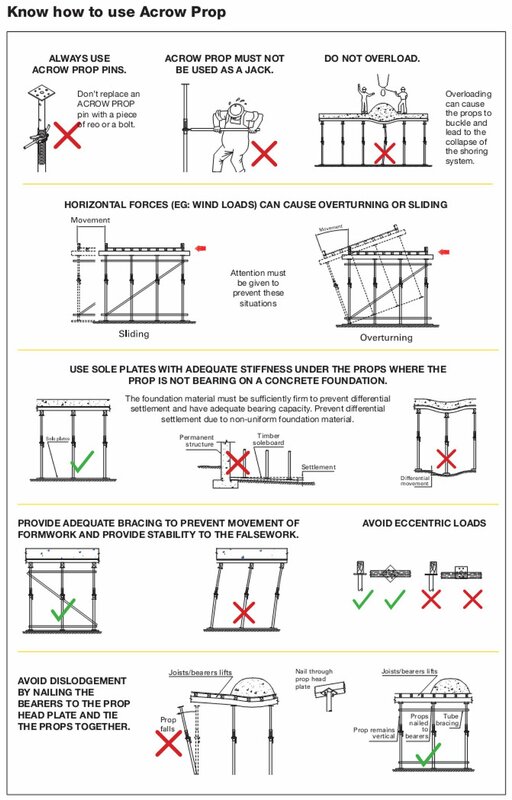 When using longer props check the safe load tables for the maximum safe working load. 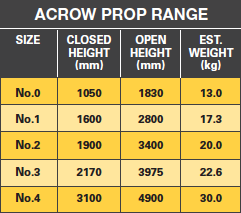 Acrow Props are available in five sizes covering a range from 1050mm to 4900mm. 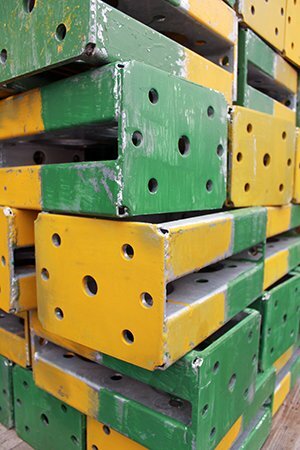 150mm x 150mm steel plates with drilled holes for securing to timber beams or facilitating the use of accessories. 48.3mm OD tube with holes at 152.5mm centres. Tube diameter enables standard scaffold tube and couplers to be used for bracing purposes. 60.3mm OD tube which accommodates the thread section and slot for fine height adjustment. Reduction couplers enable standard scaffold tube to be connected to the ACROW PROP outer-tube for bracing purposes. The thread on the outer-tube provides fine adjustment within the props given range. The rolled thread retains the wall thickness of the tube and thereby maintains maximum strength. The self-cleaning ACROW PROP nut has a hole at one end for easy turning when the prop handle is close to walls. An extra nut can be added to convert the prop to a push-pull strut. 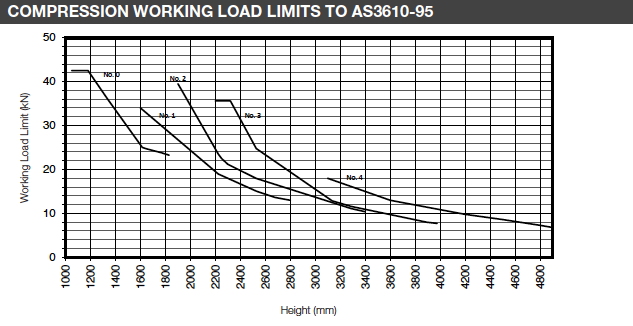 Axial compression working load limits range from 7kN to 42.5kN. Please call your local branch.